3 negatives : b&w; ; 4 x 5 in. 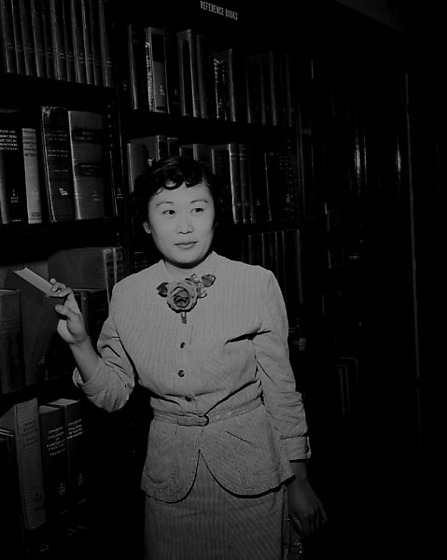 Portraits of two new teachers in the Los Angeles area, Fumi Iwasaki and Susie Osuga, California, July 27, 1950. Dressed in a belted-suit with a rose at neckline, Osuga sits in a chair and stands in library stacks pulling a book from the shelf. Iwasaki sits with an open book in her lap. 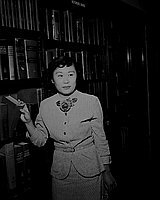 Typed on original negative envelope: Fumi Iwasaki.